THE BREWSTER TRUST and the Jason Roberts Foundation Grenada have facilitated “NicksKitCollection” in Barbados. 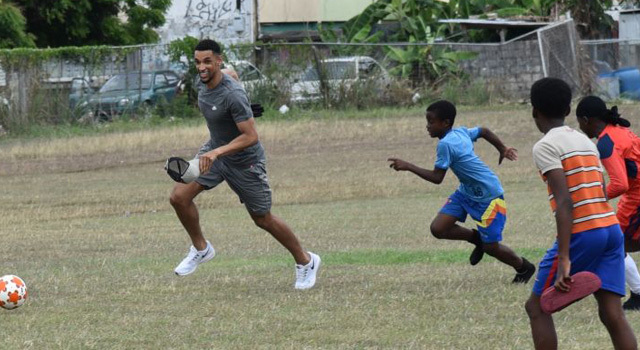 Derby County striker Nick Blackman has handed over hundreds of football shirts, donated by fans from all over the world, to young people at the Pinelands Youth Soccer Academy in Barbados. The academy sits at the centre of one of the poorest communities in Barbados where football has played a key role in addressing violence between rival gangs. The shirts were gathered as part of #NicksKitCollection, an initiative that encouraged fans and players of all clubs to donate their old shirts to those less fortunate overseas. The idea was the brainchild of Blackman and forward thinking supporter group, the Punjabi Rams, who came together to deliver the initiative. The collaboration saw more than 400 shirts donated, as well as other equipment, with fans from across the globe getting involved. Players including Derby and Ireland captain Richard Keogh, Manchester City midfielder Yaya Touré and Chelsea’s Nathaniel Chalobah all donated their shirts in support. Blackman – who has family in Barbados and has been helping communities on the island for a number of years – chose to give his share of the shirts to the Pinelands Youth Soccer Academy and was delighted to personally hand them over.